You put all of your blood, sweat, and tears into the project. You spent countless hours working with the designer, picking complimentary colors off the color wheel and finalizing the navigation menu. You even spent time interviewing copywriters to get the perfect copy for your site. Finally, you bought a hosting plan and launched your site. You knew it was going to be the biggest thing to hit the internet since Amazon went live. Then, you waited for people to check it out. You looked at your analytics every day and…nothing. No one came to your site, not even your mom. It was like it didn’t even exist. If you didn’t know any better, you would think that your site wasn’t even live. You spent all the time, but you weren’t reaping any of the rewards. It was just dead weight, floating around in cyberspace. If this sounds familiar, you aren’t alone. A lot of people build amazing websites and no one sees them. You can fix this problem by boosting your SEO efforts with rotating proxies. This will give you the chance to drive traffic to your site, which will help you move up in the search rankings. Then, you can attract some natural traffic to your site. All of that might sound complicated. Let’s break it down so you can understand how this works. Then, you’ll be ready to dive in with an SEO plan that will help you become the biggest player in your market. Normally, you buy a bundle of proxies, and each proxy comes with an IP address. You might get five proxies, so you’d get five IP addresses. That is great for most web activities. You can use your proxies to scrape Amazon or Google for information, or you can use them to stream some movies that Netflix normally only shows in Germany. That’s a great way to get around geographic restrictions. While you can do a lot of things with a handful of proxies, there is one thing you can’t do. You can’t drive traffic to your site with them. Sure, you can get five unique visits if you have five proxies, but that’s it. Five visits to your website aren’t going to make a dent in what you’re trying to do. Google or other search engines aren’t going to reward you for having five more visitors to your site. That is a blip on the radar. It won’t even register. Even if you purchase 20 or 25 proxies, it isn’t going to make a big difference. You need massive traffic if you’re going to get any real benefits. That’s where rotating proxies can help. You connect to a port, and the traffic is routed to a proxy IP. The IP changes after a predetermined amount of time. If you go with Blazing SEO, the IP address changes every 10 to 120 minutes, depending on what you choose. This is quite a bit faster than a lot of the companies out there. Quite a few of them make you wait hours for a new IP address, and they don’t let you choose how much time passes. We also have more than 6,000 U.S. IPs available, making us a great choice if you want to drive a ton of traffic to your site in a short period. That means that you can get thousands of unique hits to your website. Thousands of unique hits will help your SEO efforts. Without this service, it might take you a year to get thousands of hits. Instead of waiting a year, you can get all of those hits in a single day if you want. Of course, you can also space them out and grow your site slowly if you’d like. You’ll be in the driver’s seat, so it will be up to you. Let’s see what happens when you get all of those unique hits. You’ll be amazed by how powerful some unique hits to your website can be. When you send web traffic to your site using rotating proxies, that traffic won’t turn into paying customers. After all, you’re sending the traffic over yourself. You aren’t going to buy your own products. That wouldn’t make any sense. However, the traffic will help your SEO efforts. That is a key to getting paying customers over to your site. With that in mind, you’re doing this to reach a long-term goal. Google looks at a variety of factors when determining your site’s rankings. One of those factors is your site’s traffic. If your site doesn’t get any traffic, it won’t view it as relevant. However, if people are going to your site, Google will start to think that it’s something that people want to check out. Because of that, it will give it a bump in the rankings. Google will put it in front of more eyes so more people can visit it. There is a trick to this, though. Don’t just send the traffic directly to your website. You also need to send it there through links. You should build some backlinks that point to your site. These links should come from some authority sites. Send your rotating proxies out to these links, and then have a bot click on the link to go your site. That way, you will have different sources of referrer traffic. That will make the traffic look even more natural. It will also boost your SEO efforts even more. Backlinks are a powerful SEO tool, so you will climb up in the rankings quite a bit with this technique. This might sound like a lot of hard work, but you can make the process much easier by automating most of it with the help of a bot. Supreme Traffic Bot is one such option. 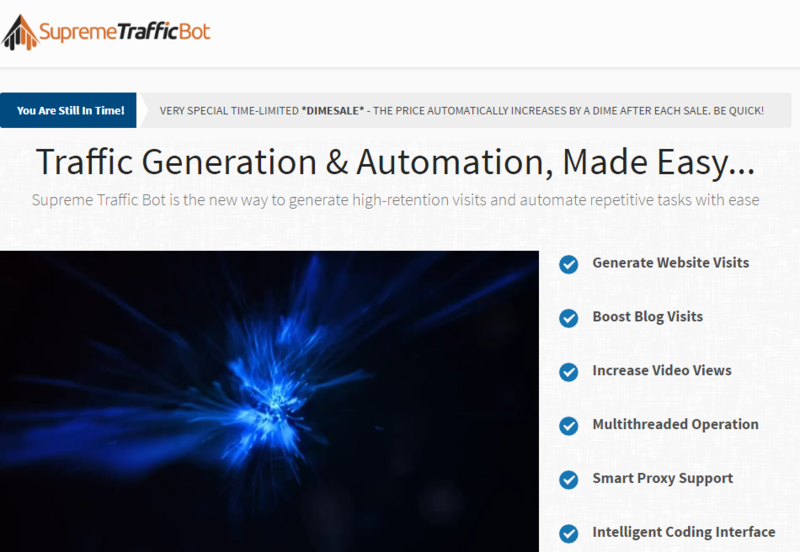 This bot has a ton of features that make it easy to get a lot of traffic, and it works with rotating proxies so you don’t have to worry about using your own IP address. First, you can use the tool to generate visits to the URLs of your choosing, including your backlinks and your website. You can actually watch the bot visit your website if you like. You can even set the bot up to hit your site from various referrer sites at once if you want, and then you can watch it all play out while you sit at your computer. This is nice to do if you want to watch the traffic roll in while you relax in front of the computer. Watching all that traffic come in is a great feeling. You can also set up delays with this tool. This helps you make the views look even more natural. For instance, 500 people from around the country probably aren’t going to visit your website at the same time, especially if you haven’t had that many people visit it since it’s been up. You can spread out those visits, though, so it looks more natural. Have them visit throughout the day so the visits don’t throw up a red flag to Google. You can also use the tool to create your own script. You don’t need to have coding experience to program the bot to complete specific actions when it visits your site. From CAPTCHA solving to interacting with your site just like a human, this gives you some additional control. You can also use the tool to achieve a 0 percent bounce rate. This will go a long way in helping your SEO efforts. If search engines notice that you have a high bounce rate, they will assume that you don’t have much to offer people. The search engines will think that people go to your site and leave immediately, and that will hurt your rankings. Having a bounce rate of 0 will catapult your website up to the top of the results. You’re at the Top – Now What? What happens when you reach the top of the results? They say that the only thing harder than getting to the top is staying there. Once you make it to the top, you need to continue to use rotating proxies so you can stay there. However, your strategy will be a little bit different after you get into a good position in the search results. At that point, you won’t just blindly direct traffic to your site. You need to have a more detailed plan about what you want to do with that traffic. At that point, you can direct the traffic to get specific actions instead of just trying to get traffic to your site. Let’s say that you have something major going on with your company. Maybe you are about to launch a new product and you want everyone in the world to know about it. You already have a great position in the search results thanks to your rotating proxies, but now, you want to make sure that everyone gets the scoop on this product launch. It’s time to go back to your proxies to make it happen. What you’ll do is create a blog post and then use your proxies to point to that post. By creating a flood of traffic to the post, you’ll tell the search engines that the post is very important. It will bring the post up in a variety of searches, so more and more people will see it. This will essentially trick the search engines into thinking that they need to show everyone in the world your post about your product launch. Before you know it, your post will be the most talked about blog post out there, and it will all be because you learned how to work the system. This is just one example. You can do this if you have any type of announcement that you want to put out in front of the world. By directing the traffic to your website, you can get your information out in front of the world. In addition, you need to continue to send regular traffic to your site. Even though your site will get organic traffic, you want to continue to raise the bar. If you can bring in more traffic each month, you won’t have to worry about dropping in the rankings. Finally, you need to add some social media tools into the mix. Many people don’t realize that search engines, like Google, use social cues when ranking websites. Social cues include social media factors. If you can get your social media campaigns in order, your website ranking can actually improve. With that in mind, create accounts for Follow Liker, HootSuite, and other social media tools. Add your information for your rotating proxies into the tools and then use them to boost your social media following. Be sure to link your social media accounts to your website so Google and other search engines will recognize the social cues when you receive a lot of likes. Also, integrate your social networks into your website to solidify the connection between the social cues and your website even more. Adding all of these signals will make it easier for your site to move up in the rankings. Rotating proxies are the key to getting ahead in the SEO world. They allow you to level the playing field and compete with some of the biggest players out there. It doesn’t matter if someone has millions of dollars in the bank and a team of advertisers at his or her side. If you know how to use proxies to your advantage, you can compete in the online world. You can drive the traffic you need to make the search engines think you’re a power player. Once you do that, there is no limit to what you can do online.